First published in 1963 by International SRM Publications in both hardcover and paper formats, and currently available in hardcover from Age of Enlightenment Press (1984), this book has never been out of print, and one can see why. It is a restatement in Western philosophical terms of the basic ideas found in Vedic literature. Maharishi also published a highly esteemed translation with commentary of the first six chapters of the great Bhagavad Gita, which translation has also never been out of print, and which has established its author's authority in the interpretation of the Vedic texts. This book is structured as a complete presentation of the nature of reality both from the Vedic view and from that of modern Western science. The author has created a new way of thinking of this material, which he calls Vedic Science, or knowledge from both the subjective (Vedic) method and the objective (Western) method. He is presenting a summary of the basic knowledge found in the Vedic tradition worded in Western scientific and philosophical terms with Western science to back it up. This was totally new at the time: an examination of ancient Veda by Western scientific method. 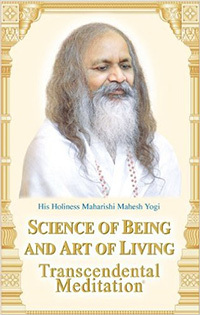 Maharishi had a degree in physics from an Indian university, so he was uniquely able to write this book. Organized into four parts, this book begins with an abstract and philosophical section called "The Science of Being," summarizing the field of pure existence in simple terms, stating that, "Physical sciences inform us that the whole of creation is built up of layers of energy, one inside the other. The subtlest constitutes the innermost stratum of creation." This section of the book continues by showing how the individual can use this knowledge in a concrete, specific way rather than merely leaving it on the abstract intellectual level. This is the greatest value of this book--that the knowledge it gives us leads to a very practical application rather than staying on the abstract. Some of the interesting chapters in the later, practical parts include "The Art of Thinking," "The Art of Speaking," "The Art of Action," "The Art of Behavior," and "The Key to Good Health." These are all aimed at achieving fulfillment of the individual, as shown in the final section, called "Fulfillment." The first part may be a bit hard reading for the reader not familiar with either Vedic literature or Western metaphysics, but once you get the basic ideas, then the rest is simply a development of the ultimately practical point established at the start. A classic everyone should read and profit from.